Macsen Williams is a complex and amazing little boy. We always felt that Macsen understood what was going on, but his multiple problems stopped him from showing it. He has evolving 4 limb cerebral palsy, epilepsy and Cortical Visual Impairment (CVI). While at Bobath (a specialist therapy centre which helps young people with cerebral palsy) I mentioned the technology that we tried. An amazing speech therapist (Niki) was very tactful, but delivered the news that switch interaction would be difficult for Macsen. She knew that Macsen would struggle with the connection between pressing a button and seeing the result on screen, especially as he would be looking the other way :). Niki asked us whether we had heard of EyeGaze technology and she told us to google Tobii. As soon as I got home I looked it up. I was very impressed, but I dismissed it as Macsen had recently been registered blind (severe visual impairment). We were working with a Visual Impairment teacher who had taught us how to gradually build up his visual skills. We introduced shapes and colours gradually, naming objects and announcing when he should look. He was showing progress, but our long term expectations were low. The 5th of February was one of the most emotional days of our lives. It was the first day that Macsen was able to demonstrate his intelligence. When we were 10 minutes in Macsen had tried a few activities, but had only glanced at the objects a few times. The facilitator (Hector Minto, UK Sales Manager) turned to the group and described how the technology worked. All our attention was focused on Hector and the Tobii was left showing a green field with 10 or so targets on it. While Hector spoke we heard an arrow hitting a target... Then another... Then suddenly all the targets fell and Macsen bust into laughter! I cannot explain how we felt... He was playing on his own! You could compare the feeling to when a child says their first word, or walks for the first time, but I'm sorry, they don't come close. Developmental milestones build up over a weeks and months, but to go from nothing to personally led play within 20 minutes... It doesn't get bigger than that! During the trial Macsen worked through lots of activities with highlights including drawing his first picture, popping bubble wrap and matching pairs of playing cards. At the end of the session we had so many emotions. We were proud of what Macsen had achieved, excited about Macsen's future, but strangely guilty that we hadn't unlocked this ability sooner. We also believe it has helped to improve his vision. We have noticed that when using the system is able to focus for longer periods; he is also able to find specific items on request like animals on a farmyard. We know that with CVI a child will develop by looking at consistent images/objects and his games have demonstrated this! 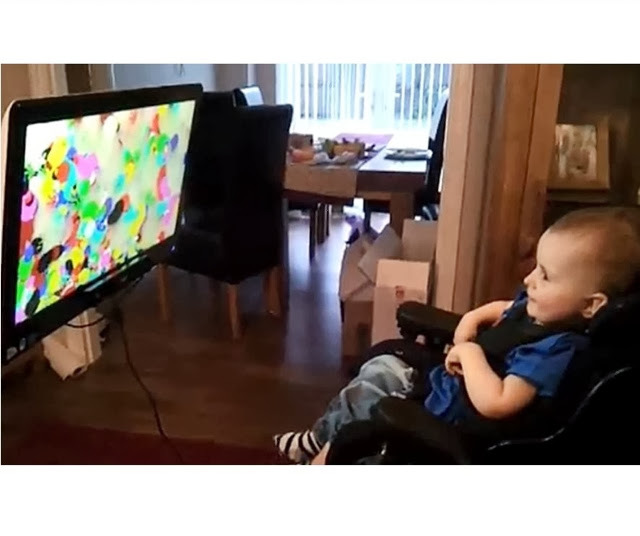 Eye gaze technology has created so many opportunities for Macsen's future. We expect that it will help to develop his vision, give him opportunities to play and we hope that it will eventually give him a voice. What a great journey....can't wait to read more about Macsen!